'Tis the season . . . to pull out your favorite holiday books, and maybe add a few more to your pile. We wanted to spotlight some new books that were released this year. Although very different in style and story, they all highlight a very important aspect of any holiday -- tradition. Whether picking a perfect Christmas tree, eating special foods, giving gifts or singing songs, let your customs and quirks shine this holiday season, and don't forget to share a good book! Red and Lulu, a pair of cardinals that live “on the branches of a mighty evergreen”, are happy in what they consider a perfect home, until one day as winter is setting in, Red returns to find that the tree—with Lulu inside it—is being taken away. Red chirps for Lulu to stay where she is and promises to find her. His search takes Red to a “strange place” that readers will recognize from the light-infused, bird’s-eye view illustrations of the New York Public Library, the Empire State Building, and the streets of New York City. 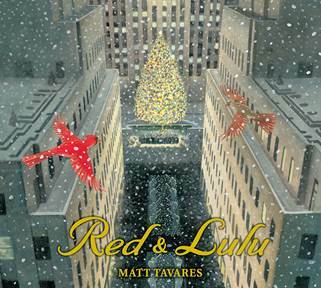 It won’t surprise anyone when Red and Lulu are reunited, but readers will almost certainly learn something new from the added information at the end of the story about the birds’ new home—the Rockefeller Center Christmas Tree. Make sure you take a peek under the dust jacket at the elegant, snowy cover. 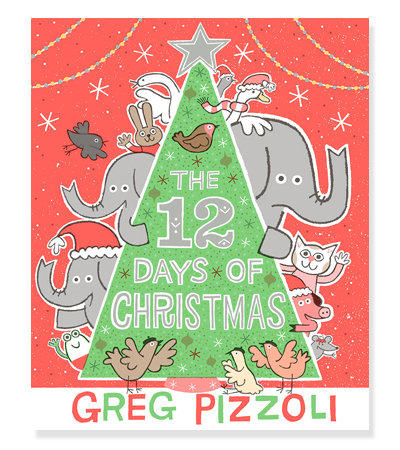 When a young elephant’s friend shows up with a partridge in a pear tree, his dad is a little wary and becomes more concerned still when the friend returns on the second day with a pair of turtle doves. The gifts continue to come, following the lines of the traditional song (three French hens, four calling birds, five golden rings), but with Pizzoli’s comic twists added into the pictures (a swan arrives with an alligator float, the maids a-milking are mice carrying cartons and glasses of milk). With each successive gift, Dad becomes more distressed, and the children and the gift-characters are too caught up in their own boisterous celebration to notice, until finally he breaks down in tears. The cartoon eyes are simple, yet unmistakably expressive, whether Dad is glaring out the window, looking with apprehension at the gifts, or warming up to the affection of new friends. Eventually, Dad softens, and the final page with a stocking hung for each bird, mouse, pig, cat, frog, bunny, and elephant lets readers know that all the characters will be celebrating Christmas together. Great for reading aloud and singing along. 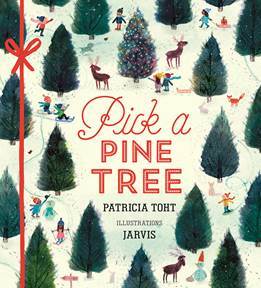 The metallic lettering and bow adorning the dust jacket wrap up a cheerfully illustrated nod to the distinct and magical experience of choosing the perfect pine tree to decorate for Christmas. Rhythmic text guides you through visiting the tree lot, finding just the right tree, bringing it home and decorating with friends and family. Warm colors and descriptive verse highlight the smells, lights, trimmings and family that are required to transform a humble pine into the perfect Christmas tree. I love illustrations with reappearing characters (the birds from the beginning make an appearance at the end of the book) and my children loved watching the happy pets join in the family festivities. Bear and Mouse -- unlikely friends that fit together so well. In this holiday installment of the Bear and Mouse franchise, we see Bear hosting a holiday party for his friend and because he has never had a real Christmas he must rely on what he has read, and "Clearly, the most important thing was pickles." Though not familiar with "Christmas pickles," it was easy to be drawn into the back and forth exchanges between curmudgeonly Bear and curious Mouse. While Mouse sneaks away to search for presents, Bear repeatedly brings him back. "Unnecessary hogwash!" Bear scolded. "We have pickles, remember." And Mouse trudged behind Bear back to the living room. 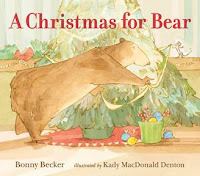 Each time, Mouse dutifully returns to his friend's party to eat pickles "from France" and to listen to Bear read a "long and difficult poem" even though all he wants is a Christmas present. The watercolor, ink and gouache illustrations delightfully capture the emotions and sweet relationship between the two while transforming a grumpy Bear and disappointed Mouse with a fitting holiday resolution.